Coach Brian Harsin of Boise State prowls the sidelines during second half action against Connecticut on September 8, 2018 at Albertsons Stadium in Boise, Idaho. Boise State won the game 62-7. Competing for college football recruits at the top level is not easy. The Power 5 schools have lots of shiny objects to throw at prospects. But Boise State’s culture and environment have won some talented hearts. BOISE, Idaho — Thursday, February 7, 2019. Just two years ago, there were National Letter of Intent Day extravaganzas, with college football fans—at least the recruiting junkies—devouring info on all the new signees. Now that December’s “early signing day” is established, the first Wednesday in February has become anticlimactic. Boise State officially announced the three additions to its 2019 class Wednesday that everybody already knew about: wide receiver DK Blaylock of New Deal, TX, linebacker Lolani Langi of South Jordan, UT, and kicker Gavin Wale from Henderson, NV. The Broncos have two scholarships left. “There’s going to be somebody late—there are going to be things that happen,” said coach Bryan Harsin. One thing that could happen is a walk-on superstar coming out of winter conditioning and/or spring football who could be awarded a scholly. With no drama on “Signing Day Junior,” the conversation turned to Boise State’s quarterback position. Brett Rypien is gone, and the race to replace him is wide open. Hank Bachmeier and Kaiden Bennett were early enrollees last month. Already on the roster are senior Jaylon Henderson, redshirt freshman Riley Smith and last year’s backup, sophomore Chase Cord. 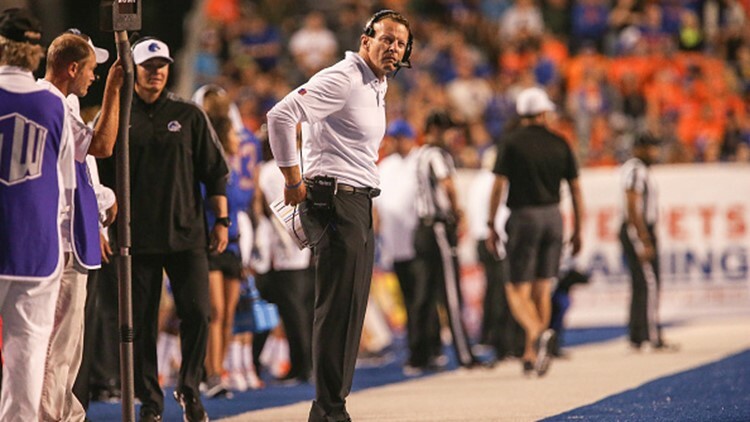 “We will not have a starter coming out of spring ball,” said Harsin. “We will not have a starter going into fall camp. We’ll have a starter about 10 days out (from the Florida State game).” Well, that will keep everyone engaged. It also tells Cord, whose torn ACL will keep him off the field until fall camp, to keep his chin up. Harsin seems resigned to the fact that not all of them will ultimately remain Broncos. That’s just the way it is in today’s “transfer portal” world. This is the highest-rated class in Boise State history and the top-ranked list this year in the Group of 5. The Broncos have cracked the top 50 for the first time at No. 48. I’ve spent a lot of time talking about the widening crevasse between the Power 5 and Group of 5. The difference in money is staggering. So, look at the three schools immediately following Boise State, and you’ll be able to appreciate what an accomplishment this is: Northwestern, Georgia Tech and Syracuse. It’s been pointed out that all but one of the 18 players the Broncos signed had at least one Power 5 scholarship offer. UCF is the next Group of 5 school at No. 55. The next Mountain West team is Colorado State at No. 84. You know what everybody will say now. The pressure will be on Boise State to cash in on this talent. Boise State busted out to an 8-0 lead on UNLV Wednesday night. Then the Rebels started making their three-pointers. Again and again. The Broncos shot well enough in the first half to stem the tide, but UNLV’s barrage finally took its toll early in the second half, leading to an 83-72 win for the visitors in Taco Bell Arena. The triples put Boise State on its heels once the Rebels had forged ahead. The Broncos were able to tie the game 68-68 with six minutes left—then, guess what. A three-pointer by Kris Clyburn, the Rebels’ 13th of the night, gave UNLV the lead for good, and the Rebels finished the game on a 15-4 run. Boise State? It went 1-for-10 from three-point range after halftime. It was another head-scratcher for Boise State. The Broncos shot well last Saturday at Nevada but lost by 20 points to a superior team. And, while they struggled from three-point range, they still hit 54 percent from the field Wednesday night and lost by 13 at home against a team they had expected to beat. What happened versus UNLV was enlightening. Something has gone south defensively for Boise State. The Wolf Pack shot 56 percent from the field and went 13-for-28 from beyond the arc. The Rebels shot 54 percent from the field and were 14-for-26 from three-point land. “We just let them move the ball wherever they wanted,” said coach Leon Rice on the Learfield IMG College postgame show. “They were way too comfortable.” Rice also bemoaned the Broncos’ 9-for-17 performance at the free throw line. It was 3½ minutes into the second half Wednesday night before a player not named Braydey Hodgins or Rachel Bowers made a field goal for the Boise State women. But in the end, those two were able to carry the Broncos to a 64-57 win at UNLV. Hodgins and Bowers each notched career highs with 28 and 19 points, respectively. They combined to go 17-for-22 from the field while the rest of the team was an unfathomable 5-for-38. Nevertheless, Boise State improved to 18-3 on the season. More importantly, the Broncos now have sole possession of first place in the Mountain West at 9-1 following New Mexico’s 61-59 loss Wednesday night at San Diego State. ARE THE STEELIES FOREVER AN ECHL TEAM? Sports radio personality Dave “Softy” Marler of KJR in Seattle tweeted something the other night that will get some water cooler talk going. “From Dave Tippett on ‘Tuesdays with Tip’ tonight on KJR: 2 possible destinations for @NHL Seattle AHL team: Boise and Palm Springs.” Tippett is the new Seattle franchise’s senior advisor. Well, if Stockton can be an AHL city, Boise certainly can. I guess that means CenturyLink Arena’s 5,200-fan capacity is enough for Triple-A hockey. Meanwhile, on the ECHL ice Wednesday night, the Utah Grizzlies pulled into a first-place tie with the Idaho Steelheads via a 4-1 victory in West Valley City. Back to the recruiting trail—we know where the Rufai brothers are headed now that they’ve left the Boise State program. They are both going to be Vandals, signing their National Letters of Intent to play for Idaho Wednesday. They can play right away since they’re transferring to the FCS. Kayode Rufai, who played 10 career games for the Broncos and logged 18 tackles with half a sack, will be a junior with two years of eligibility remaining. Mujeeb Rufai redshirted as a walk-on freshman defensive back in 2018 and has four seasons remaining. Idaho signed 11 more players Wednesday, giving it a 2019 recruiting class of 26. The Vandals also landed Mountain Home High wide receiver Nehemiah Parker, a second-team all-state selection who had 33 catches for 505 yards and seven touchdowns last season. College of Idaho has spread its recruiting wings the past couple of years, but this year the Coyotes aggressively mined the state of Idaho. The guidelines in the NAIA are different, and the Yotes class is massive. There are 40 players, 31 of them from Idaho. Among the more familiar names (can’t hit ‘em all in this space) are Capital quarterback Ryan Hibbs, Timberline running back Ed Osterberger, Rocky Mountain defensive back Kaimana Nawahine, and Bishop Kelly defensive end Luke McLaughlin, the 4A SIC Defensive Player of the Year. Joe DiMaggio signs a contract with the New York Yankees making him the first $100,000-a-year baseball player. That was a lot of money in those days, but inflation wouldn’t bring it remotely near today’s highest salary—L.A. Dodgers pitcher Clayton Kershaw made $34 million last year. DiMaggio would play just three more years, retiring after the 1951 season. The Yankee Clipper’s most famous feat was his amazing 56-game hitting streak in 1941.